We’re one layer of cheese away from the final bake – oh, man talk about full meal deal! Yes, you read that right! Steak and potatoes or pizza – who said you needed to choose? 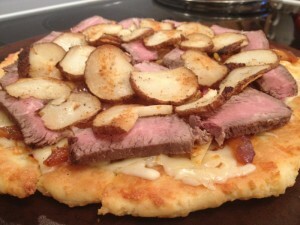 While I love a good steak and potato dinner, putting it on pizza just put this whole thing over the top. As you might have guess from this site, I am a sucker for fusions of flavours. And one of my favourites has to be Italian with Cajun as with this pizza. The only thing I have to warn you about is that it takes a bit of prep. But the results were oh so awesome! These would be good even if they weren’t on the pizza! Pre-heat your oven to 425 degrees while you start to slice your baker. You’ll want to make each slice about 1/8th of an inch thick but not all the way through on the bottom. Leave about a quarter of the potato on the bottom. 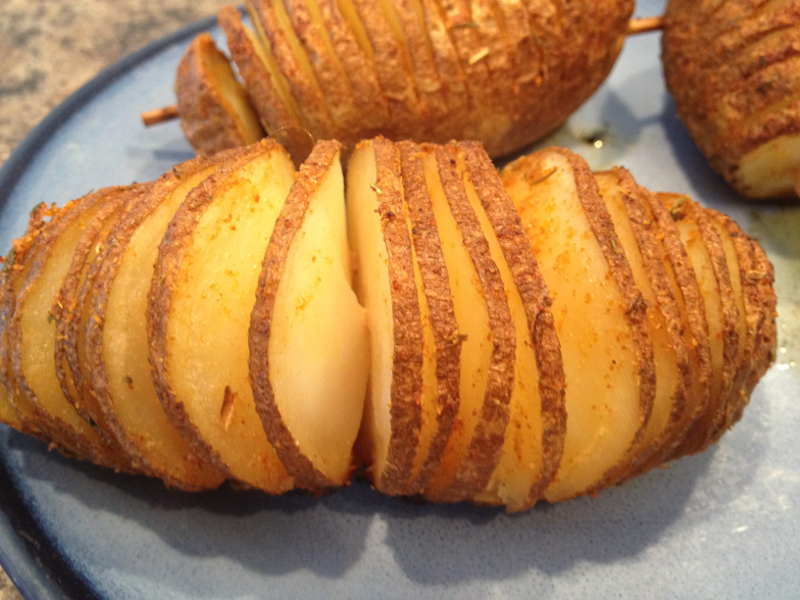 You could use toothpicks to keep the sides together if you cut through the potato to the bottom (like me!). Drizzle the baker with olive oil and a healthy amount of the Cajun seasoning. Bake for about 50 minutes – remember, it will cook up a bit more on your pizza when it is in the oven. You might want to cook your steak before you start working on your pizza dough. The steak is best pan fried with lots of Cajun seasoning. And this is where you should make the choice of onions cooked with the steak or using the BBQ sauce for the base of the pizza. Cook the steak to a little below the rareness that you like – it will cook up as it sits as well as in the oven (like the potatoes). Cut the steak into slices about a quarter inch thick. After you’ve done your first bake to set the dough, layer in the following order: Provolone slices, BBQ sauce and then steak or steak and onions, potato slices and then topped with Pepper Jack. Then into the oven for the final bake. Top with chives and serve immediately!